A recently refurbished three bedroom terraced property in the heart of Yatton. EPC rating D. DESCRIPTION Situated in a quiet cul de sac location with a great sized rear garden and parking to the front. Ideally suited for a number of different purchasers, close to railway links to Bristol and local amenities, this property is sure to be snapped up. Currently comprising a light and welcoming entrance hall leading to the sitting room with wooden floors and ample storage space, following on through to the kitchen/breakfast room which has been recently refurbished with a brand new kitchen, with a great range of base, wall and drawer units including an integrated oven with separate electric hob. There is a brand new downstairs bathroom with a mains rainfall shower over bath; potential utility cupboard having plumbing for a washing machine. 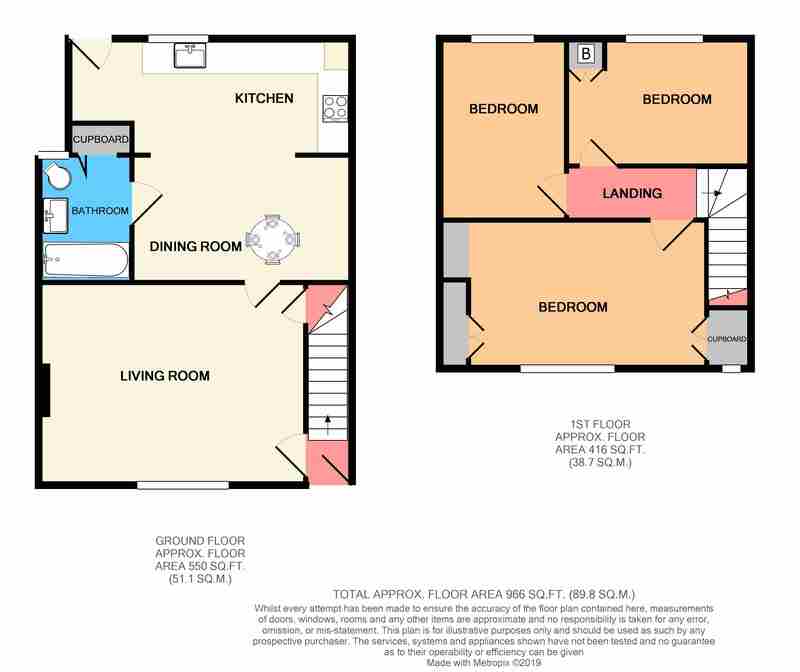 Whilst on the first floor are the three good sized bedrooms, with the master bedroom having great storage space and the potential to add a WC. The entire property benefits from wooden floors throughout, double glazing and gas central heating. Outside there is ample parking and a generous rear garden. DIRECTIONS From the centre of Yatton heading in the direction of the train station and Clevedon, proceed over the railway bridge, travel down the road until you reach the mini roundabout. Take the first exit onto Wemberham Lane, then turn right onto Horsecastle Farm Road. Follow the road down and Wakedean gardens will be on the left. The property is located just down the road on the right hand side. SITUATION The North Somerset village of Yatton lies south of Bristol within easy daily commuting distance, by rail or road, with M5 motorway junctions 20 (Clevedon) and 21 (Weston-super-Mare) each only 10 minutes drive away. The village is extremely well served by a great variety of facilities, which include lots of shops including a supermarket, a chemist, doctors, church, library, restaurants, takeaways and pubs. There is a junior and infants' school within the village, and secondary schooling is available at nearby Backwell. Public transport includes regular bus services and the station which gives mainline railway access to Bristol and out to London Paddington on a regular basis. For the long distance traveller, Bristol International Airport is a short drive away, now with low cost air flights and an international service to the USA. The countryside around is mainly farmland and with the Mendip Hills, the Yeo and Chew Valleys to the south and east, providing a huge variety of country pursuits including walking, riding, sailing and fishing. The area has a number of first rate golf courses, and the 4-star Doubletree by Hilton Cadbury House hotel, restaurant, spa and fitness centre is situated on the edge of the village. WE HAVE NOTICED A great sized property with the advantage of being able to move straight in and unpack. There is also the potential to add a WC upstairs off the master bedroom (subject to any necessary planning consents). This is a great plot, located near to well rated schools and main transport routes; we recommend an early viewing, to avoid disappointment.